The cost of fixing an oversight in the design of Naftzger Park in downtown Wichita is rising, and again we’re not to talk about it, even though there are troubling aspects. Last week the Wichita City Council was scheduled to consider an item regarding the rebuild of Wichita City Council. That item was removed from the agenda the day before the meeting. It now appears on the agenda for the February 12 meeting, and with a higher price tag. 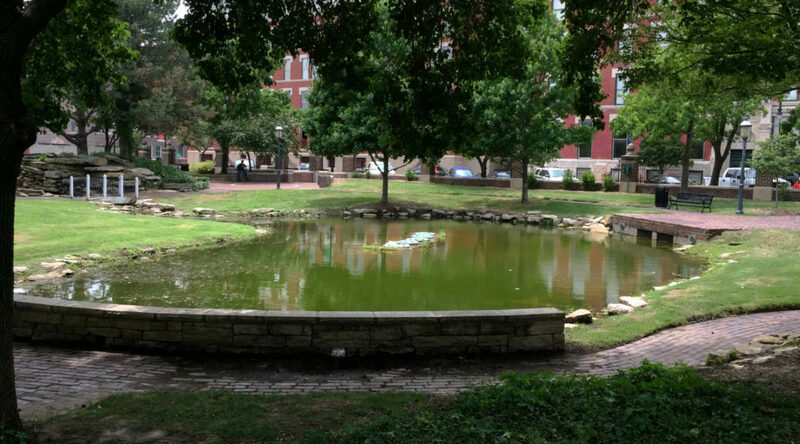 As the city explains in the agenda packet for this week, “Naftzger Park currently has a small pond that acts as a storm water retention facility during rain events. Proposed improvements to Naftzger Park will eliminate the pond and all available storm retention. The project does not include funding for replacing the retention capacity.” The cost is given as $115,000, up from last week’s $85,000. As explained last week, this seems like a major oversight in the original project plans. The city has regulations regarding stormwater retention that private sector developers must follow. Didn’t any city planners consider these regulations as the project was planned? Didn’t any council member or bureaucrat look at the plans and wonder about stormwater drainage? Wasn’t there a highly-regarded architect designing the park? What about TGC Development, the developer of the surrounding property, to whom the city effectively outsourced the development of Naftzger Park? The construction manager? Of note: This week the agenda tells us this: “Funding is available for transfer due to the scope of project being adjusted to remove some the structural repairs and the abutment treatment after discussion with the railroad were not successful.” This sounds like structural repairs were planned but not executed. This deserves discussion, but with the item being on the consent agenda, discussion is not likely. Of further note: The February 5 agenda stated, “Funding is available for transfer due to underruns of bid items upon project completion and favorable bid pricing.” This made it sound like all planned work was completed and the city spent less than budgeted, even if through happenstance. This week we’re being told something different.